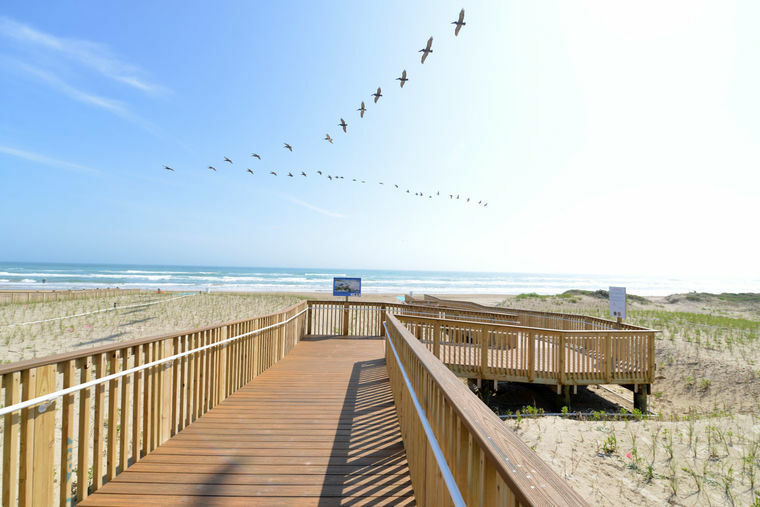 Pelicans fly above the newly renovated E. K. Atwood County Park Tuesday morning at South Padre Island Cameron County Beach Access No. 5. With a pair of oversized scissors, Cameron County Judge Eddie Trevino Jr. cut a ceremonial ribbon Tuesday to mark the official opening of the renovated E.K. 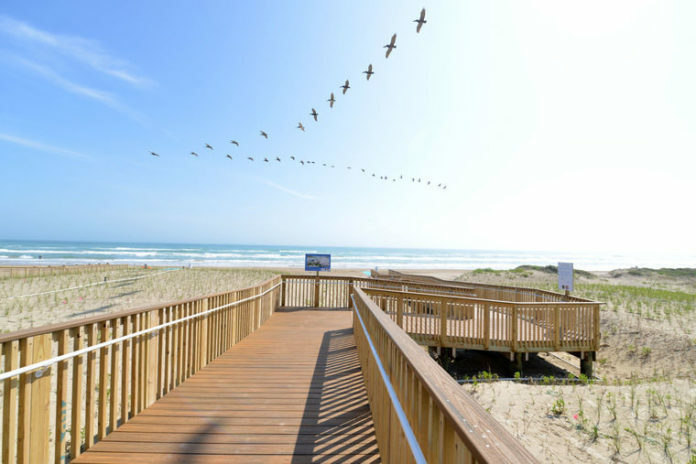 Atwood Park on South Padre Island. The site located on Beach Access Road No. 5, received nearly $3.8 million in upgrades that includes an elevated plaza with five pavilions, two restrooms, rinse stations and two dune walkovers. Improvements also include four food truck parking spaces. Chicago’s Hot Dogs, Kona Ice and Burger Shack were on site giving samples to ceremony attendees, and County Parks Director Joe Vega said commissioners will vote next week on year-long contracts for the spaces. Precinct 1 Commissioner Sofia C. Benavides said CameronCounty closed the facility in 2015 after a news report on trash in the park prompted her to see the problem for herself. Officials determined the deteriorating structure was unsafe and opted to shutter it. Around the same time, they began working on the parks’ master plan. “We knew small fixes would not get the job done,” she said. Emilio Escobar, chairman of the Cameron County Parks Advisory Board, lauded staff who worked on the renovations for taking an environment-focused approach. The new structure is water and salt resistant, he said, and capable of withstanding strong storms. “Everything they’re doing is first-class,” Escobar said. The new parking lot, comprised of pebbles and honeycomb-shaped mats rather than asphalt, is designed to allow rain to filter through. It will result is cleaner runoff returning to waterways, officials said. Students with the Cameron County Juvenile Justice Department’s cadet program constructed the plaza’s picnic tables as part of their community service activities. E.K.AtwoodPark is the first completed project in the county’s $40 million park improvement plan. Construction is underway on about $6.2 million in Isla Blanca Park improvements.